I love starting the week off with seeing a beautiful creation by design team member, Olivia Marmara. Her cards are always so vibrant, with rich colors, they just make you smile! Perfect way to try and combat the Monday... Back to Work Blues. I think that should be a song title - LOL! 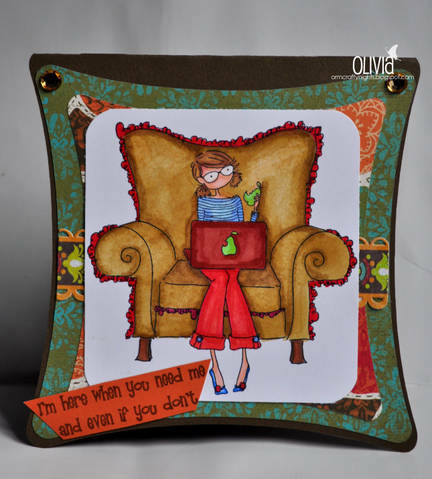 Olivia used the ADORABLE Perry on her Laptop stamp from the Uptown Girls Collection from Stamping Bella. I love the gorgeous fall colors that Olivia used in her papers and then capturing them in coloring her image too. This is one of my favorite stamp lines and this image is so fun to use! Just think of all the paper piecing you could do on that fabulous chair! I also love that Olivia used a non-traditional card shape which just adds to the charm of this card! Love this!! Not to mention...this is totally what I have been up to for the last two days! I feel like I have not been off my computer except for coffee runs, then potty breaks, and to grab a bite of food! I have been busy listing lots of new in stock items, with lots more being delivered today that I will need to add! I have also been busy going through the Design Team applications! We have had some awesome entries so far makes it so hard to choose! You still have until the 27th to get your's in! You have a few more hours to play in this week's Loves Rubberstamps Challenge - Make Your Own Background so be sure to get your's in! We will be giving away a prize voucher to our store for one lucky player :) We will start a new one tomorrow and I promise you that the Design Team has really outdone themselves for this next one! The samples are GORGEOUS! Plus the challenge will be really fun as always! Come play along with us! Well, I am off again to get some customer orders packaged up to mail, get some blog posts pre-scheduled, and get some more goodies listed in the store! Love adding new stuff!! This is so adorable!!! Love the shape and the adorable image. I LOVE what you have ADDED to the STORE!!!! I couldn't wait til payday, had to get my order in before they are all GONE!!! And I want to order more on payday too!! !